This week saw the opening of a new exhibition at the Casa del Manzoni in Milan, home of the Fondazione Per Grazie Ricevute. 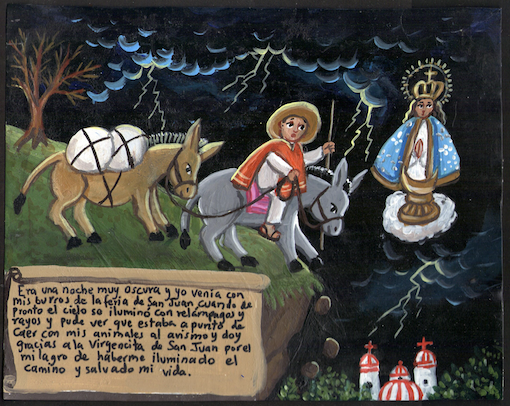 The exhibition is entitled “Buena Suerte – Milagros de México” «Folklore e tradizione negli ex~voto messicani contemporanei», and it presents a colourful series of around 300 votive retablos from Mexico, most of which are painted on tin. 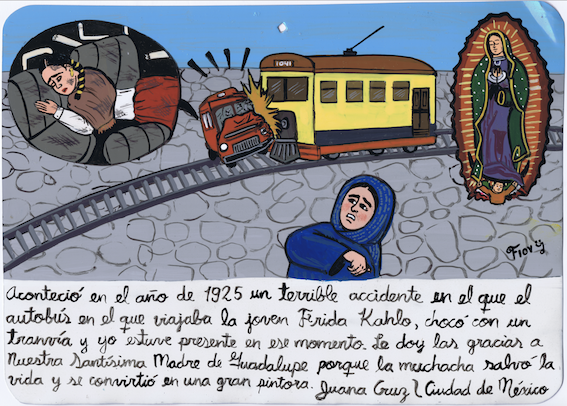 The Press Release explains how “the painted ex-votos narrate moments of everyday life which are often ironic, mixed with ancient popular legends like that of the Chupacabras (a mythical animal which looks like a coyote), and Llorona (a spectre-like woman who is on a never-ending search for her lost offspring).’ And we learn how these ex-votos had a major impact on the work of Frida Kahlo (1907-54), who produced some fantastical imaginary retablos recounting episodes from her own life. The exhibition, which is curated by Roberta Riccio, is open for a whole year, until the end of March 2019. But for those of us who can’t make it to Milan, the Fondazione P.G.R. has kindly sent some images to include in this post, so that we can enjoy some of the highlights of the exhibition – grazie mille! 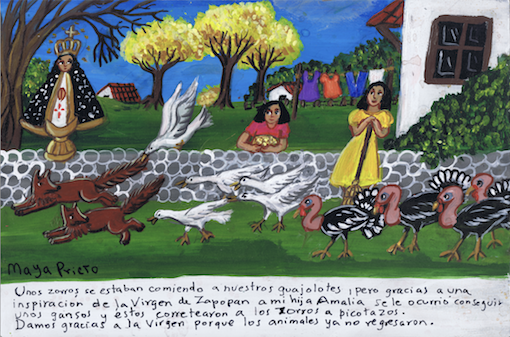 “Buena Suerte Milagros de México” is open from 20th March 2018 to 29th March 2019, at the Casa Manzoni, via Morone 1, Milan. Opening hours are from Tuesday to Friday, 10am to 6pm, and Saturdays from 2pm to 6pm (last entry 5pm). The museum is closed Sundays, Mondays and Public Holidays. Entry is free, and guided tours are available on request. ← Miniature mirrors: votive or apotropaic (or both)?